Too cute! Love the pink. 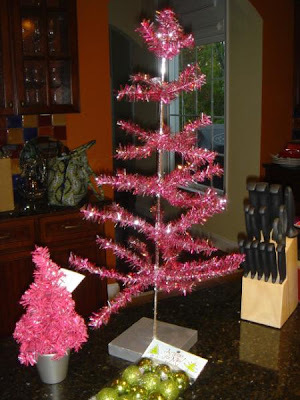 I have a mini pink shoe tree I put out for Christmas with shoe ornaments! Those would look so cute in my daughter's playhouse at Christmas! I may just have to make a trip to Hobby Lobby soon! Oh love the big pink one! I have a silver one like this, but the pink is darling!! I love the PINK TREES!!! Our nearest Hobby Lobby is an hour and a half away but I am going this week to look specifically for those trees!!! Love the pink! Thanks for the sweet post on my blog. Cute preppy pink and green Christmas! Love it.